3-Sentence summary: Beka Cooper is a new trainee (Puppy) in the proto-police force known as the Provost’s Guard, or the Dogs. Almost immediately after joining up, she gets caught up in two big cases, one involving multiple murders to protect the whereabouts of a vein of extremely valuable fire opals, and the other involving a mysterious child killer known as the Shadow Snake. It’s tough going for Beka, but she has a secret: she can hear the voices of the dead. Six word review: Pierce rocks a new writing style. I started reading because: Tamora Pierce is covering new territory with this book, as it is not only narrated differently (first person past tense, in the form of a journal, instead of third person omniscient past tense), but it stars a non-noble heroine, and is a detective story (although it doesn’t skimp on the action). I wanted to see how she did with it. I kept reading because: She did great. It’s a very engaging read, with an awesome heroine, an interesting plot, and diverse and fleshed out supporting characters. I loved: The chemistry between the characters, especially Beka and her trainers Goodwin and Tunstall. I hated: Well, I don’t really hate anything, but for someone trained to rely on her memory as much as possible and is writing the story as a memory exercise, Beka sure has trouble remembering plot points that aren’t supposed to be revealed yet. I couldn’t get enough of: Beka and Rosto. Those two have such fun chemistry. If the lead character was in a high school yearbook, she would be voted most likely to: Catch a crime lord. On a deserted island, the main character would probably: Immediately start working on a way to get out. She’s a city girl at heart, and practical enough to know that she doesn’t have the right survival skills. 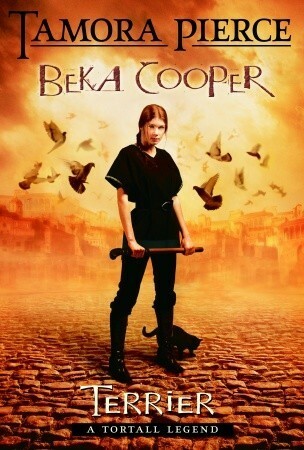 This entry was posted in Read This!, Teen Powered and tagged author crush, Beka Cooper, detective stories, fantasy, mysteries, Tamora Pierce, Teen Book Reviews, woman power, written by teens on January 24, 2015 by Teen Blogger. LEARNING > WAR. That is all. How the author of The Fault in Our Stars built an ardent army of fans. In late 2006, the writer John Green came up with the idea of communicating with his brother, Hank, for a year solely through videos posted to YouTube. The project wasn’t quite as extreme as it sounds. John, who was then twenty-nine, and Hank, who was three years younger, saw each other about once a year, at their parents’ house, and they typically went several years between phone calls. They communicated mainly through instant messaging…. To read Margaret Talbot’s complete article, visit The New Yorker. To watch more vlogbrothers (which we highly recommend!) visit their Youtube channel. This entry was posted in Author, Events, Heard 'round the interwebs, Movies, Read This!, Watch This! and tagged author crush, books to movies, cancer, DFTBA, drama, Fault in Our Stars, John Green, nerdfighters, TFIOS, The New Yorker, vlogbrothers, youtube on June 8, 2014 by Rae. I recently attended my first book signing at Powell’s Books in Beaverton, Oregon. My best friend and I left school early and drove for four hours to see one of our favorite authors, Phyllis Reynolds Naylor. Naylor, who lives in Maryland, is the author of over 130 books, among them the beloved Alice series. The series chronicles a girl named Alice from the age of 8 to 60. My friend and I both started reading the Alice series when we were 8, and feel like we have grown up alongside Alice. When the last book in the 28-book Alice series came out October 15, 2013, she and I eagerly snatched up our own copies and read them within a couple days. When we heard that Phyllis Reynolds Naylor was going to be in the northwest, we knew we had to go see this remarkable women who helped shape both of our lives through her stories. This entry was posted in Author, Community, Read This!, Teen Powered, Tidbits and tagged author crush, author visits, written by teens on March 1, 2014 by Teen Blogger. When I was in the seventh grade, I honestly had no idea who Jane Austen was. I think I had seen the film Pride and Prejudice once before, but I couldn’t recollect the basic plot of the story. That all changed when I saw another film Lost in Austen, a remake of Pride and Prejudice. It made me extremely curious to read the book myself. Fortunately, the book was available at my school library so I picked it off the shelf and brought it home to read. Now as a seventh grader my reading level was not very advanced and classics were a bit difficult for me to analyze. But after slowly reading the book out loud, word for word, the words stuck and I found myself plowing through this book. I don’t know when and how exactly it happened, but I found myself in love with this author’s writing style. Quickly, I got more of Austen’s novels and eventually I had read six of her completed novels. Each book was very similar, and yet so different. Each of the characters had their own personalities and qualities which made them unique and different from each other, from Anne the serious to Marianne the dreamer. Each book had its own taste and feel as well. If you read Persuasion for instance, you will get a far more serious novel than the comedy Northanger Abbey. It was like my own little world or secret; a topic no one at my school had ever heard of, and a little retreat from the world around me into a different century. I felt at home reading those books. I would find myself thinking about them in class and in all my leisure time, wrapped up in the different stories. It sounds rather amazing having this beautiful knowledge of a great story, but at points it frustrated me a bit that I had no one to talk to about these novels. None of my friends had read them, let alone heard of them. It seemed that no one was interested. But I think that if someone were just to take a jump into the deep end and just give it a go, I think that they would enjoy it as well. If you are interested in Austen’s books, I have a couple to recommend. My two favorites are Persuasion and Northanger Abbey, and I think these are great reads for people starting out with Austen. If you would rather be more comfortable in something more familiar, Pride and Prejudice and Sense and Sensibility are by far the best known, and would be great starts to get to know the author. I hope you give Austen a try, and if not, try some other classics. Maybe you’ll find your secret world, too. This entry was posted in Read This!, Teen Powered, Watch This! and tagged author crush, Ballard, classics, Jane Austen, Teen Book Reviews, written by teens on December 12, 2013 by Teen Blogger.